Empire Today - Tossed saleman out of my house! Jul 08, 2010 Laura, Your satisfaction is truly important to us and as a member of the Customer Service Management Team, I apologize that your experience with us didn't meet your expectations. Unfortunately, I've been unable to locate your information in our system and I would like for a member of our team to speak with you about your concerns and also a resolution. 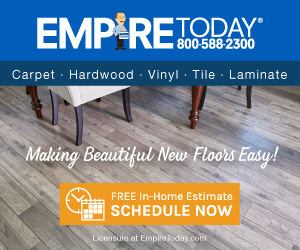 If possible, would you be able to contact us 888-588-2315 x4195, a member of our team will be happy to assist you or email us at customersupport@empiretoday.com with your contact information and we will follow back promptly. Rebekah Clerk, National Customer Service Manager. last week during bad weather our basement flooded, so we are carpet shopping for our fixed basement! Make the appt, sales *** comes 1 he was LOUD 2 he treated us like we were dopes, then 3 was getting nasty with us...that was it for me I threw his A&& out of my house, tomorrow I call the BBB on Empire. Review #159785 is a subjective opinion of LauraD509. Could have told you not to use....had someone come in to give me a door estimate....what a crook made me feel he was doing me a favor...i guess he saw single home owner and thought he could get over....I asked hime to take his estimate and shove it! I INADVERTENTLY REFERRED TO EMPIRE AS BANNER....THAT'S WHO I'M GONNA CALL NOW TO SEE IF THEY'RE ANY BETTER....NEVER USE EMPIRE! At least you got the chance to meet with a sales person, *** or not. I scheduled an appointment, my wife and I cancelled appointments and took time off work to be there, and then Banner calls 1 hour before the appointment time and cancels. Then they have the balls to ask me to re-schedule....Give me a fu..in break! And as far as the written responses, who gives a sh.. The only apology I would accept is re-imbursement for my time that I took off work and that will never happen! Thank you for bringing sales experience to our attention. We apologize for any inconvenience, and our customer service team would like to work with you to explore a resolution. Please contact us at 800-588-2300 so we can assist you.